NW Beach Volleyball hosts its programs and tournaments at Bottega Fitness Park (now Bottega Beach Volleyball Park). Indoors, we operate one of the largest junior volleyball clubs in the region; but we have been running beach programming for junior players for years. Our beach programs are open to players (boys and girls) from any club in all age groups. Beach volleyball is a fast growing sport, and Bottega is the destination to learn, improve, and train for beach volleyball in the Northend. Northwest Volleyball offers beach volleyballs program for juniors of all ages. Our programs are open to both girls and boys. Both are encouraged to join and jump into the fun sport of beach volleyball. All beach coaches are Beach IMPACT certified and will be under the guidance of the Beach Director. Our 2017 acquisition of Bottega Beach in Snohomish (just 5 minutes north of Woodinville), allows the club to use up to 6 courts at a time, and to use the courts throughout the day and evenings, 7 days a week. This means that the only limiting factor for training opportunities is the energy and drive of the participants. With Beach Volleyball booming in the club, high school, and collegiate ranks, now is a great time to jump in to the game and learn a lifelong sport. The scholarships for young women are getting more numerous, and the opportunities for growth and travel have exploded across the nation. But the training isn't just for those looking to earn scholarships; just like our indoor club, we feel that the opportunities should be available for athletes of all ages and levels. Every interested athlete is encouraged to tryout and enroll, and the program will be molded to fit the goals and abilities of the athletes that participate. Our Beach Volleyball Tryouts are not solely based on a single age, but based upon ability level and growth potential. With 6 courts and unlimited possibilities, the program and training athlete cap has not yet been set, but will be posted here when defined. If there is a large amount of interest, we will do our best to accommodate numbers and add training opportunities if possible. We hope that you will see the wonderful opportunities opening up for Beach Volleyball in the Northwest and that you'll come out to Bottega Beach Volleyball Park to play, train, and build something special with us! We offer several beach programs for players of all skill levels. We still run our Junior Grand Prix Series. We kept this a USA Volleyball sanctioned series so the players that play indoors do not have to purchase a new or exclusive membership to participate. We run this series at Bottega Beach and at Alki Beach. 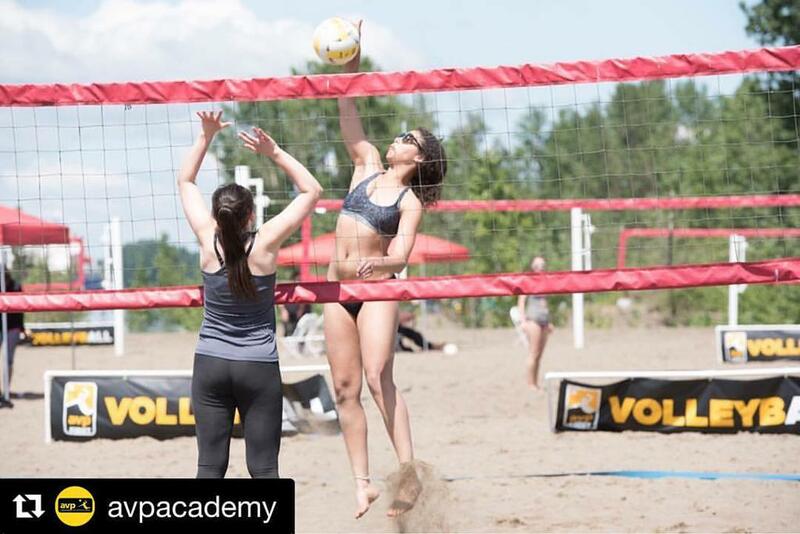 We do run a Junior Beach Club-- AVP Academy Northwest -- we are one of 6 AVP Academies on the West Coast and we are honored to have the backing of the AVP for our programs. We offer AVP related programming including AVP Academy, AVP First, and AVP Next events. Currently our beach club has about 40% players from NW Juniors and 60% from other clubs. We encourage any player - even if you didn't play club volleyball - to participate in our Beach Club/AVP Academy. We have Beach Camps. These are day camps and give players a lot of opportunities to improve. In addition we offer Spring Beach Training and Private Group Lessons.